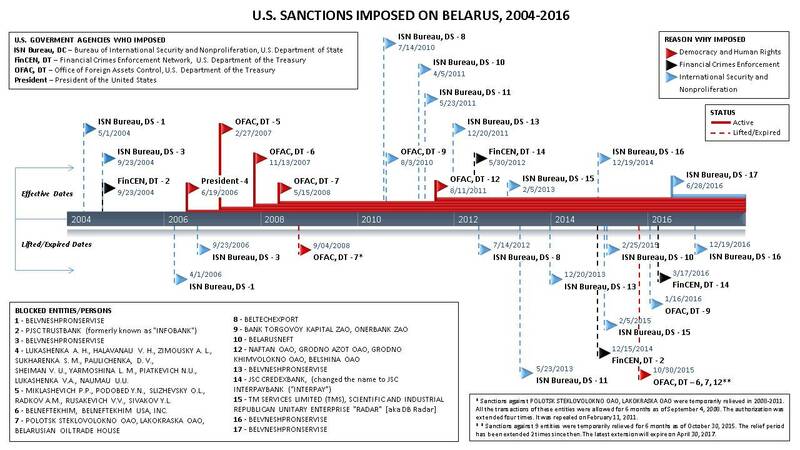 During the period of 2004-2017 the United States 17 times introduced the sanctions against Belarusian individuals and entities. Ten of those were related to the issues of international security and the nonproliferation of weapons (mostly after Belarus contacted with Iranian companies), five times Belarus was mentioned in reference to the issues of democracy and violations of human rights, and two times in relation to financial crimes and money laundering by the Belarusian banks. In 2008 after the release of political prisoners sanctions against Belarusian companies Polotsk Steklovolokno and Lakokraska were temporarily relieved. All the transactions of these entities were allowed for six months as of September 4, 2008. This authorization was extended four times. On February 11, 2011, after the brutal crackdown of Belarusian authorities against the opposition, that followed the presidential elections of December 2010, this authorization was repealed. Currently, the sanctions of the U.S. governmental agencies are imposed on 16 individuals and 10 Belarusian companies. All current sanctions were imposed due to the serious violations of human rights and democracy. The sanctions against Belvneshpromservice are imposed because of the violation of the Iran, North Korea, and Syria Nonproliferation Act. As of October 30, 2015, the sanctions against 9 entities (except Belvneshpromservice) were temporarily relieved for six months. The relief period has been extended 2 times since then. The latest extension will expire on April 30, 2017.